“Brainless in Seattle, Part 1” is a decent episode, but it functions exactly like its title indicates. It is part one of a much more narratively complex story but without part two, the episode falls a little flat. It also makes it more challenging to discuss, because it introduces so many new plot points that have no emotional or narrative pay-off yet. So instead of trying to speculate what is going to happen in part two, I am going to treat this episode like a standalone for now. I will acknowledge that this episode continues to develop some pretty ambitious ideas for the season, but without knowing how any individual narrative thread is going to come together, I am going to try to stick to commenting on what I do know. While the plot point about the zombie cult/church played a vital role in last week’s episode, “Brainless in Seattle, Part 1” puts that storyline on hold for the week in order to explore yet another sinister threat to the safety of the citizens of Seattle. We discover that anyone who tries to come into/leave Seattle is either scratched (thus making them a zombie) or murdered. This new development is introduced to us in two important ways — and Blaine and Fillmore Graves seem to be at the center of most of the conflict. The first important plot thread of the episode is that Seattle has a severe shortage of brains. In order to maintain the city the way it is, something has to change. If Fillmore Graves doesn’t find a new way to acquire a steady supply of brains, Seattle will soon run out and the aftermath will be catastrophic. The additional problem related to this is that new people entering the city are being scratched, even though that isn’t supposed to happen. The alleged culprit is Renegade — the human smuggler we met at the end of last week’s episode. It is not yet clear why she is scratching people (especially since she seems so compassionate and thoughtful), but the important thing is that Chase Graves wants her eliminated. It is not yet clear what Chase Grave’s long-term goals for New Seattle are; he is keeping his plans to himself, since even Major is not privy to the deeper machinations underway by Chase and Fillmore Graves. It is evident that Chase does not trust Major with the more “classified” plans, and in many ways I think that is why he wanted Major to work with and recruit new zombie teens to join the Fillmore Graves army. If Major is occupied with trying to train impulsive and aggressive teen zombies, he won’t have time to focus on anything else. It is a calculated move on the writers’ part, because it leaves the audience as much in the dark about what is really going on in Seattle as our characters. However, the episode does give us a bit of insight into at least one facet of what is clearly a much larger problem. By the end of the episode, we discover that there is a serial killer living in Seattle. He masquerades as a coyote, takes copious amounts of money from people that are trying to cross into Seattle, gives them a false sense of security, and then murders them. The case of the week centers on one of his victims — a young woman who tries to enter New Seattle in search of love. The reason the case is ultimately so important is because it speaks to a much greater issue plaguing Seattle. I discussed it in my post last week, but it is worth repeating that having a wall surrounding New Seattle is oppressive and dangerous. By limiting who can come in and out of the city, Fillmore Graves has essentially turned Seattle into a prison. As a result, people will go to extreme lengths just to try to escape or bring loved ones in. So to find out that anyone who “defects” ends up dead, while Fillmore Graves turns a blind eye, speaks to a much bigger problem. I don’t yet know what the possible solution to this problem is going to be, but it does set a very dark tone for the rest of the season. 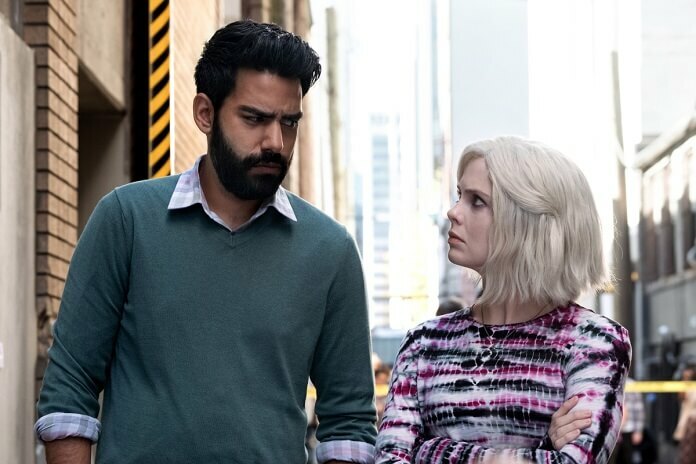 Dealing with a possible serial killer is not something that iZombie has tried to grapple with before, so it will be interesting to see how it unfolds in part two. It is an ambitious move for a show that doesn’t function like a standard procedural and yet, it could still end up working well. This episode also gives us a lot of good Blaine material. In any other context it would seem like a paradox, but Blaine truly is at his best when he is unapologetically evil. In this episode, Chase tasks Blaine with finding and killing Renegade — and in return, he is allowed to do whatever he wants. In the process of trying to track her down, we see Blaine at his most brutal. He kills and eats the brains of someone in order to uncover information, and in the process he reveals that he is indeed the one who stole Ravi’s zombie cure vials last season. I always assumed that Don E. stole them for Blaine, so it was nice to get that confirmation. The question now is what does Blaine plan on doing with the remaining sixteen vials? If he kills Renegade and Chase gives him the power to do whatever he wants, we might actually get to see what Blaine is capable of doing at his absolute worst. After his non-existent storyline last season, I would certainly welcome the full-fledged return of “evil” Blaine. The episode also asks the audience to question what Blaine’s connection to the serial killer might be. We know that Blaine’s business thrives off his ability to provide quality brains to the zombies of Seattle, and that they are obtained on the black market. But we also know that there is a brain shortage in Seattle for everyone and that the official Fillmore Graves shipments are producing fewer brains with ever visit into the city. So since we now know that people who are brought into city are being murdered and their brains are then sold for profit, is Blaine involved in ordering the hits on these people? Or is Chase the one responsible for ordering the hits? They both stand to benefit from the serial killer's handiwork, but it is still unclear what the true motivation is for either one. Is it about creating a culture of fear so that order is maintained, or is it about profiting from the deaths of innocent people? Regardless of what the connection is (and there is still a possibility that there isn’t one), I hope that part two addresses this next week. Beyond providing the audience with some wonderful and silly moments, being on this brain does not give Liv as much to do narratively and that is part of what makes the episode feel a little weak. In a lot of ways, this episode doesn’t give any of our characters a whole lot to do. However, despite not having as much interaction as we normally get, the few scenes we do get with Liv and Clive are incredible. In a moment of rare introspection, Liv has to decide if she should go against the instincts of “lovesick brain” and tell Clive that Dale is cheating on him. It is a disheartening discovery, but I also cannot say I am surprised that Dale is cheating on Clive. She is a hard character to like, and I really do think that Clive could do a lot better. So unless we get an alternative explanation for her actions in the next episode (like maybe Clive and Dale have opened up their relationship in order to still meet their individual needs), they really should break up. Even though Liv decides not to tell Clive for now, I really appreciated her snide comments toward Dale. She essentially calls Dale a “dead-weight” who only exists to bring her partner down. While it is blatantly inconsiderate behavior — as is her thinly-veiled attempt to set Clive up with his new co-worker — in this instance I am going to give Liv a pass on her behavior. Despite being on an optimistic brain, she chooses to go against the personality of the brain in order to say how she really feels. This also proves that she is capable of making independent choices, which is something she previously denied was possible. She cares about Clive immensely and doesn’t want to see him get hurt. So while we don’t yet know how this particular plot point is going to resolve, it is important for the audience to know that despite everything, Liv is still going to be there to support her partner. “Brainless in Seattle, Part 1” ultimately ends up feeling a bit disjointed. It introduces yet another complex element to the overall narrative at the expense of some of its other storylines. As I mentioned previously, this episode primarily serves to establish important things to come. But until they actually happen, it just feels like the show is using this episode as a placeholder. I appreciate all of the ambitious moves that the creators of the show have taken recently, but it still feels like the ideas are only partially realized. The more new elements the writers introduce to the story, the more confusing every facet of the show becomes. 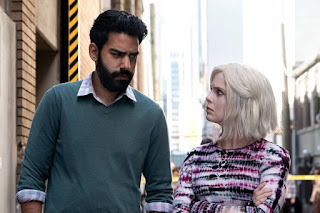 While I understand how limiting it can be to fit every element you want into a thirteen episode season, sometimes a show can collapse under the weight of trying to do too much, and I worry that iZombie is heading in that direction. I still have faith in the writers of the show, but until I start to see resolution or emotional payoff for some of these ambitious plot threads, I am going to remain a little frustrated. Hopefully “Brainless in Seattle, Part 2” will start to provide some of the resolution I am looking for. Tune in next week for my coverage of that episode! Or you can stop watching..eyeroll..